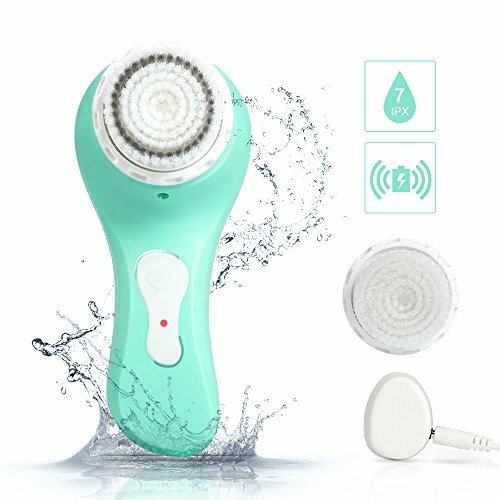 MiroPure Sonic Facial and Body Cleansing Brush, Professional Electric Face Brush 2 In 1 Waterproof Portable Wireless Charging Cleaning brush for All Skin Exfoliating Deep Cleaning by MiroPure at Lash Beverly Hills. MPN: CS0648. Hurry! Limited time offer. Offer valid only while supplies last. View More In Skin Care Tools. ULTRASONIC VIBRATION FOR MULTI-FUNCTION: The active technology has been applied in this Ultrasonic Rechargeable Cleansing Brush, the inner circle and outer circle can be vibrated 220 million times per second, conveying double vibration to remove your blackheads, whiteheads and minimize your clogged pores and smooth bumpy skin, exfoliate dead and dry flaky skin or aged corneum, fade away acne scars. YOUTHFUL & HEALTHIER SKIN: With your 2 Mode Facial and Body Cleansing Brush it is simple to clear away makeup, dirt, oil and dead skin! Specifically designed to work for all skin types normal, dry, sensitive and oily! Also, the body brush & the body mode will give your body skin a youthful boost. It will brighten up your skin and keep you looking young and vibrant by massaging away fine lines &wrinkles! IPx7 LEVEL WATERPROOF & 2 SPEED MODE: your Ultrasonic Rechargeable Facial and Body Cleansing Brush is 100% waterproof which makes it the perfect shower buddy! The facial and body brush heads can be cleaned to avoid accumulation of dirt. There are 4 daily cleansing modes: sensitive, deep clean, exfoliate(body) and pulselift, which provides you with 4 different options that you can adjust any mode so as to adapt to your skin. If you have any questions about this product by MiroPure, contact us by completing and submitting the form below. If you are looking for a specif part number, please include it with your message.